Understanding non-binary or genderqueer pronouns can be slightly confusing as we are used to using “she/her/hers” or “he/him/his” pronouns, but now including non-binary pronouns need to start becoming a part of your daily vocabulary. Including “they/theirs/them” and others (see end of post) pronouns is very important. 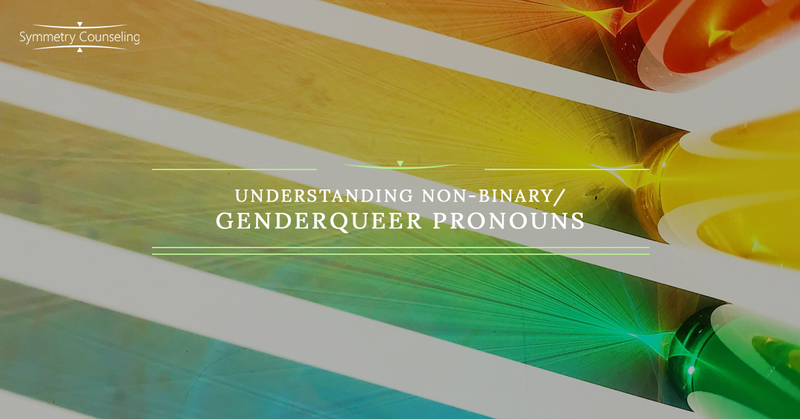 In this blog, I will help you understand and how to use the correct Non-Binary and Genderqueer pronouns. ⦁ Normalize Pronouns: Normalizing pronouns should become a part of your routine. Adding your pronouns to the bottom of your email signature is a great way to start. You can even include a link to what pronouns you prefer to be called by so people can gain an understanding of how you would like to be identified. ⦁ Ask: Ask people what pronouns they would like to be called by. Practice this: Hi, my name is _____. I prefer to go by ______ (insert pronouns). What is your name and what is your preferred pronouns?” So for example, my introduction would go “Hi, my name is Meenal Patel. I prefer to go by “she/her/hers pronouns. What is your name and what are your preferred pronouns?”. ⦁ Effort: the only way to get better is by practice and putting yourself in uncomfortable situations to gain experience. Put effort into getting to know someone by their choice of pronouns. ⦁ Practice: Practice practice practice. Being comfortable with using non-binary pronouns can be hard, but practice makes everything better. Use sentences with “they/them/theirs” in it. ⦁ Don’t Assume: Assuming that just because a person looks a certain gender does not mean that they use those pronouns. I am very cautious and often times will use a gender neutral pronouns or ask them what pronouns they prefer before addressing them. ⦁ Include Pronouns: Depending on where you are at, getting a name tag with your name and writing your pronouns on it can be very helpful. Making it clear of what pronouns you prefer to be called by can make things a lot easier. ⦁ Apologize: If you accidentally mis-gender someone, apologize and fix your language moving forward. Do not console them and try to explain why you mis-gendered them, just apologize and make a better effort next time. ⦁ Non-Binary Greetings: You do not always have to greet everyone with specific gender names but use greetings that are not gender specific like “yall” or “dude” or “folks”. Use verbiage that does not directly talk to just one individual so that you are not inclined to mis-gendering them. ⦁ Correct: Correct the person who has mis-gendered you or your friend. Be polite, but still inform them that you or your friend prefer to be called by other pronouns. Genderqueer or non-binary individuals should be able to feel comfortable in their community. ⦁ Not Everyone is the Same: Individuals are allowed to choose what gender pronouns they want to be called by and they can also change. Not always will the pronouns will be the same but ask what they prefer to be called by is important. See below for a brief list of non-binary pronouns that you or others can choose to be called by. Finding what pronoun you are comfortable with can sometimes be difficult. Start with “they/them/theirs” and then trying other pronouns can be helpful. You do not have to stick to the first pronoun that you think fits you. If you are struggling with finding a pronoun that you agree with, feel free to contact Meenal Patel, MA, LPC for support in identifying who you are.